A rendering for Kwadwo Adae's Edward Bouchet Mural Project. Photo courtesy of the artist. One artist will return to two plays that have been sitting on the back burner. Another will dive into a body’s fight with itself—with a collaborator thousands of miles away. A third will get on a plane, and bring everything he learns back to Connecticut. A fourth will be able to record the album he's been thinking about for years. And downtown, one more will make sure a man’s legacy lives on over a century after his death. 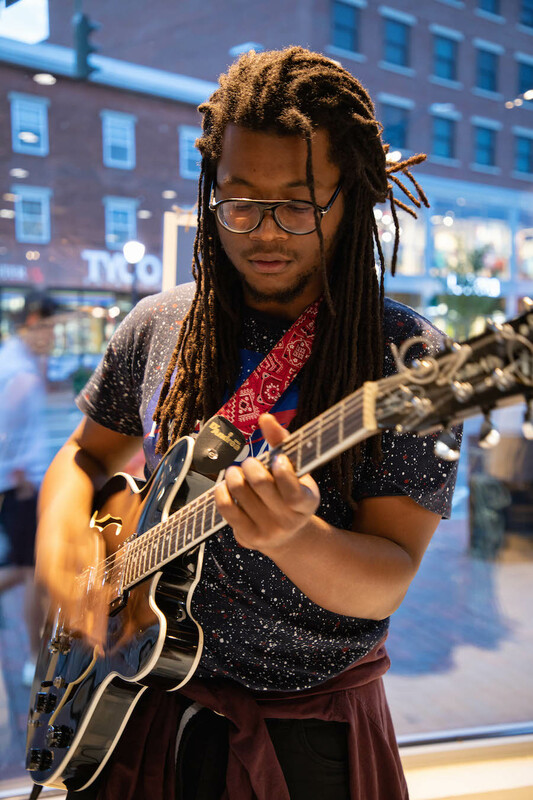 The five, all New Haveners, are among 50 Nutmeggers to receive 2019 fellowships from the Connecticut Office if the Arts, of which they were notified Tuesday morning by email. They include Collective Consciousness Theatre (CCT) Founder and Director Dexter Singleton, hip-hop poet, playwright and The Word facilitator Aaron Jafferis, public muralist and teacher Kwadwo Adae, as well as independent artists Anna Russell and Cliff Schloss. Adae classifies himself as an "honorary New Havener;" he lives in Bethany but works and runs an art school in the Elm City. Tuesday afternoon, the Connecticut Office of the Arts released a full list of grantees to the public, with awards of $1,000, $3,000 and $5,000. Singleton and Jafferis have received $5,000; Adae has received $3,000; and Russell and Schloss have received $1,000. 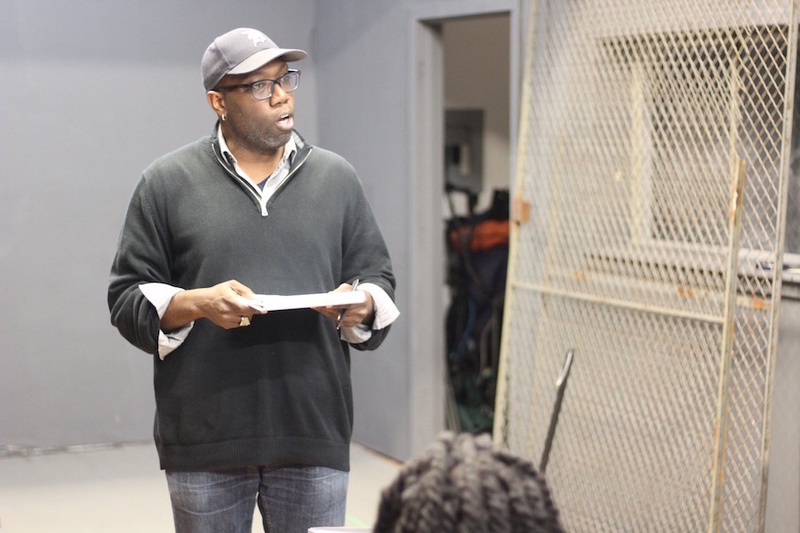 Dexter Singleton at a rehearsal for Jesus Hopped The A Train, which he directed, in fall 2018. Lucy Gellman Photo. Each will be using the funds for specific projects. Reached by phone Tuesday evening, Singleton said he will be using the grant to travel to Chicago to explore the social and economic impact that neighborhood-based theaters have on the communities surrounding them. He said he chose Chicago in part for its cultural richness, and the proliferation of theaters based in the same kind of equity work around which CCT was founded. During his time in Chicago, Singleton said he plans to visit Victory Gardens, Jackalope Theatre and Adventure Stage Chicago among others. He will also be visiting the League of Chicago Theatres, a service organization dedicated to theater in the city and run by his longtime friend and colleague Deb Clapp. Then he plans to bring it back to New Haven, where he runs CCT with Artistic Director Jenny Nelson out of a black box in Erector Square. He said that he has toyed with the idea of a more visible physical storefront for the theater, and hopes that the research gives him some more insight. 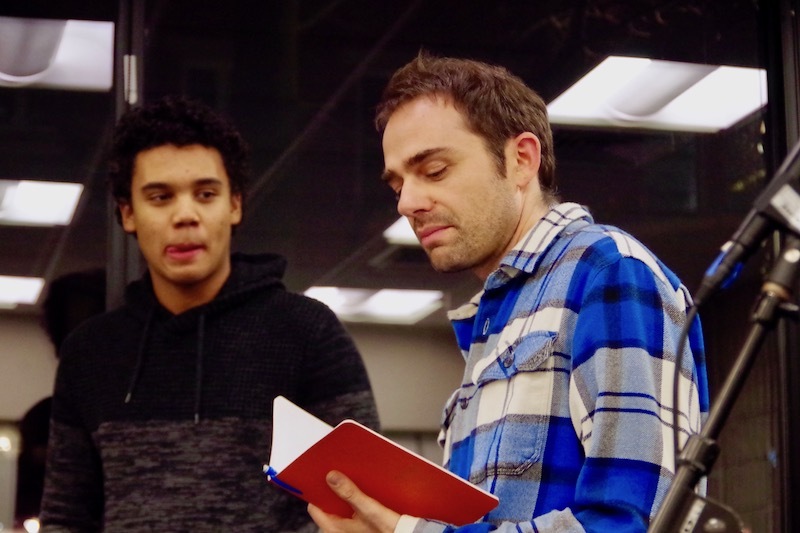 Aaron Jafferis with ECA student Anton Kot at a cypher for The Word in early 2018. Lucy Gellman File Photo. That approach is also true for Jafferis, who will be using the grant to return to two scripts he has been working on for several years, and hold a reading of a play that would not have been possible without funding. In a phone call Tuesday night, he described a decade of working on How To Break, a collaboration with Collective Consciousness Theatre and New Victory Theatre in New York City “about young people in a children's hospital battling for control of their bodies.” After performing an earlier draft at New York's Here in 2012, and excerpts of the show at Planned Parenthood of Southern New England (PPSNE) last year, he said he wanted to present it to a larger audience, but didn’t have the financially capability to do so. The grant fills that need. While New Victory offered the team room for rehearsal and and performance space for free, this money will allow him to compensate artists and directors for their time and labor. He will also be returning to his work Smooth Criminal, an exploration “based on my own experience with class, race, and consciousness in New Haven.” In early 2016, he presented an in-progress version of the show’s first act at Collective Consciousness Theatre (read an old Arts Paper article about that here). But when Jafferis lost his mom in 2017, he said he couldn’t go back to the show for a while. He plans to use the grant to both go back to the script and collaborate with a musician on the work, which includes music, spoken word poetry, tight verses, and audience participation. “I won't know until I actually start writing it again if I can,” he said Tuesday, adding that he is also interested in building out a solo show that he can tour to schools, universities, and area institutions. Until the grant, he has been unable to dedicate time to even thinking about it. Jafferis said the grant will also be transformative for him in simply giving him the space to work. In the past year, he estimated that he has applied to 50 grants, residencies and fellowships in playwriting and musical theater, and been rejected from all of them because his work does not fit entirely into either category. Drawings courtesy of Anna Russell. Other artists have smaller projects tied to their individual growth. Russell, an independent artist who works full time as a museum assistant in exhibitions and collections at the Yale University Art Gallery, will be using the fellowship to dive deeper into a series that she’s just starting, with an unlikely collaborator who is halfway across the country. The project has its origins in January and February of this year, as she began to draw memories of her own diagnosis and recovery from transverse myelitis, an inflammation of the spinal cord that left her partly paralyzed at 13 years old. After uploading her drawings to Instagram, she started getting messages from a Texas man who explained that he was struggling with transverse myelitis and found her through a hashtag. Now, Russell is planning to embark on a series about his diagnosis and recovery. With the fellowship, she said she is still firming up how to use the funding (“I’m still processing the news,” she said when first reached Tuesday) but is considering taking a little time off “for a week of drawing in a cabin somewhere,” or putting it toward a limited-run zine or book project from the collaboration. “The timing of this couldn’t be better,” she said. Clifford "Cliff" Schloss performing on Broadway last year. Photo courtesy of the artist. Elsewhere in New Haven, musician Cliff Schloss will be using the $1,000 fellowship for one simple thing he’s needed for years: a computer that won’t crash while he’s recording at home. Born and raised in New Haven and Hamden, Schloss studied music for a year at Hofstra University, but had to return home because of a tuition and scholarship issue. Back in the Elm City, he became a teaching assistant and then a teacher at Neighborhood Music School, where he still works. A year ago, he went on a songwriting binge after “having a big heartbreak and wanting to put it all out there … wanting something people could listen to.” Because he didn’t have the right equipment at home— since 2015, Schloss has been fighting deep freezes and crashes on a clunky Dell Inspiron computer—he recorded in a friend’s studio. He realized that he wanted to be able to do the same thing by himself, in his own space. Bit by bit, Schloss saved up to buy cables and recording parts, getting by with secondhand cases for his instruments. But a computer remained too expensive. Every time he tried to record something himself, theInspiron would balk. He recalled one particularly frustrating session, during which he and his cousin were creating “this amazing jam” and the computer froze for 45 minutes, then shut down entirely. Everything they’d made was lost. Now, he’ll be using the grant to buy a Macbook computer with enough capacity to record in his own space. He said he sees it as a significant growth opportunity, in which “I can capture this new music myself,” and push through a few projects he has placed on the back burner while trying to scrimp and save for equipment. If there is any money left over from the computer, he said he plans to buy a hard-shell case for his jazz base, for which he’s been using a soft hand-me-down. "It would make me sleep better knowing my stuff is safe,” he said. Kwadwo Adae working on his "Women's Empowerment Mural" in Newhallville last June. Lucy Gellman Photo. 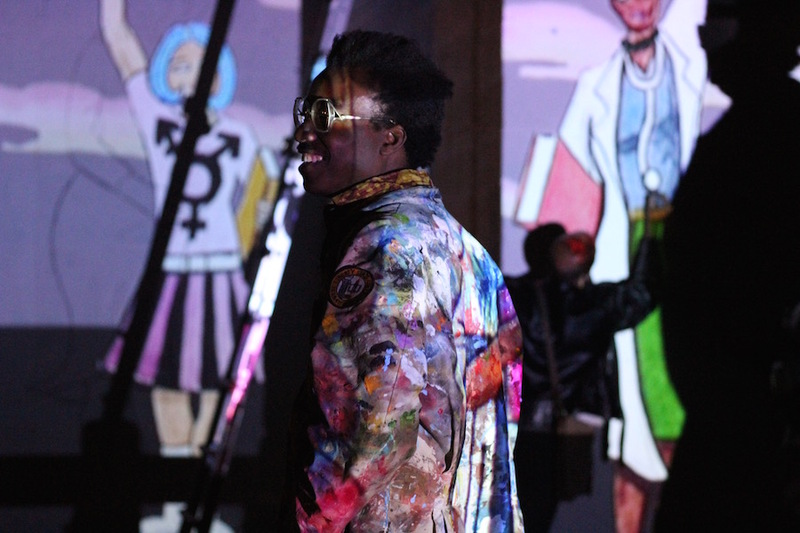 In the mix is also one large public art project, coming to New Haven’s downtown from artist Kwadwo Adae. 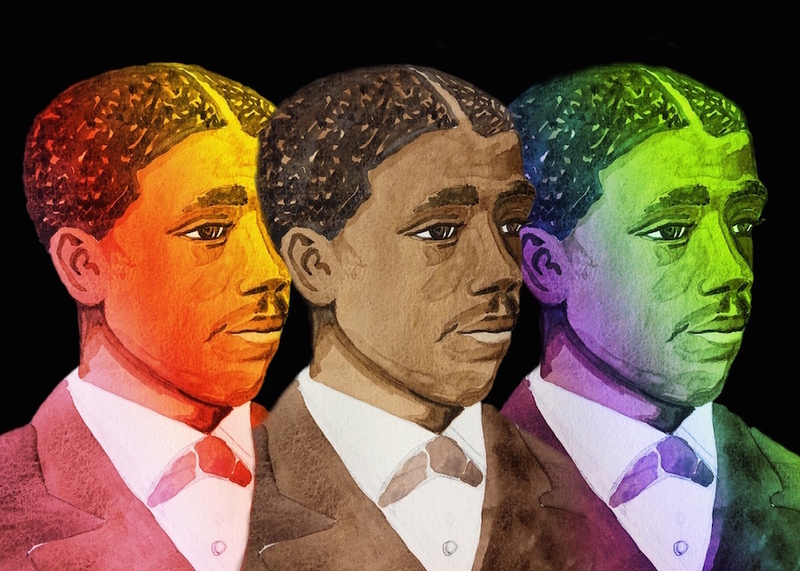 Earlier this year, Adae pitched the Could Be Fund on a Ninth Square mural memorializing Edward Bouchet, the first Black man to earn a doctorate from Yale University. Tuesday, the fund awarded Adae $25,000 for the project, pending his ability to match that money by June. His $3,000 fellowship from the Office of the Arts will go directly toward that match. In a phone call Tuesday evening, Adae said that he also plans on seeking donations from both Yale and The Hopkins School, from which Bouchet graduated in 1876 and 1870 respectively. He will also be starting a Kickstarter campaign similar to those he has had in the past. After graduating with a Ph.D. in physics in 1876, Bouchet went on to make contributions in the field until his death in 1918. As an artist of color in New Haven, Adae called it an honor to celebrate the legacy of the scientist. Pending approval of the property owners, the mural is planned for the back of First Union National Bank at 55 Church St.
“Here we both are, two black men, walking the same streets in the City of New Haven, separated by 143 years and now connected through time by art,” Adae wrote Tuesday. “I really believe the story of Edward Bouchet is really something that we should all know about,” he added Tuesday night. In the past months, Adae said he has been visiting Bouchet’s grave at Evergreen Cemetery to pay him homage and update him on the project. After introducing himself to Bouchet last year, Adae said he goes to the cemetery to have conversations with the scientist, and to think about how his legacy lives on in the Elm City and in the world.